For the first part in this two-part series, go here. 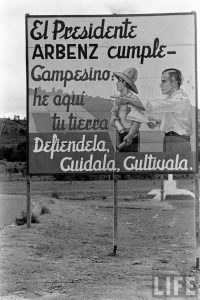 Guatemala’s current situation and tragic history can be traced back to the CIA-led coup in 1954 that ousted the democratically elected government of President Jacobo Arbenz and installed the military dictator Carlos Armas. Arbenz was an advocate for land reform and was loved by the poor. The wealthy hated him. And when the CIA couldn’t bribe him, they ousted him in a most humiliating way. Even after he went into exile, the agency used constant disinformation to smear him in every way imaginable until his strange death in a bathtub in 1971. 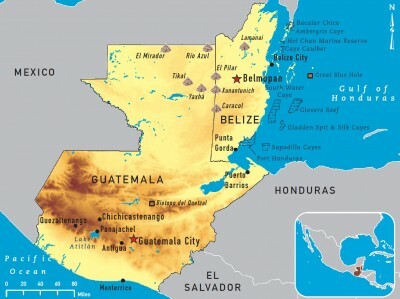 Since the 1954 coup, and with the ongoing support of the CIA and the School of the Americas (SOA), the Guatemalan people have lived a nightmare. What follows should give you a sense of the CIA’s thinking behind the coup and its aftermath. It is a transcription of a CIA document released to The National Security Archive, a research institute, on May 23, 1997 under a Freedom of Information Act request. A hammer, axe, wrench, screwdriver, fire poker, kitchen knife, lamp stand, or anything hard, heavy and handy will suffice.” For an assassin using “edge weapons,” the manual notes in cold clinical terms, “puncture wounds of the body cavity may not be reliable unless the heart is reached. If one is searching for the truth about the coup, the document above is accurate and revealing. However, if one searched the web and discovered a posting at globalsecurty.org (see sidebar at the end of the article) one would be misled. That posting is nothing more than a summary of a Congressional Research Service report. It never mentions Guatemala, although it includes other Latin American countries — Argentina, Bolivia, Ecuador, El Salvador, Honduras, Panama, and Peru. A gullible reader might come away with the impression that the School of the Americas had nothing to do with Guatemala, when, in fact, it had a great deal to do with it. Why leave out this country in particular? Could it be that GlobalSecurity.org is unfamiliar with documents such as the one described above? Is it one of those glib sites that posts articles that do not give the full picture, even if inadvertently? Or is it a site that presents disinformation? The web is filled with questionable information, so one must proceed skeptically. Those interested in the truth must probe much deeper, but that is difficult as the following account of the propagandist Edward Bernays makes clear. The 1954 coup d’etat was ably assisted by American Edward Bernays, Sigmund Freud’s nephew, who is often called the “father of public relations.” He is barely known to the general public and is part of our secret history. A war propagandist for the US during World War I, Bernays used his propaganda techniques — now called PR — to “engineer the consent” of the American people on behalf of the power elite. Leading up to the 1954 coup, he was the chief propagandist for The United Fruit Company and in that capacity created a vast media campaign painting the Arbenz government as communist and in cahoots with the U.S.S.R. This was the height of the Cold War, and the American government was consumed with using anti-communist and anti-Soviet rhetoric to defend its spheres of interest; for a long time the American government, in conjunction with American corporations, had considered Latin America and the Caribbean their de facto colonies. The United Fruit Company — now Chiquita Brands International — was an American corporation that had controlled vast tracts of land and numerous businesses in Guatemala and throughout Latin America since the early 1900s. The company was known for its support of dictators and the exploitation of the people and the land. Intimately linked to the power elite within the US government, United Fruit extracted huge profits and rejected any reforms that challenged its control of the land. It was the largest landholder and employer in Guatemala. It owned railroads and discouraged the building of highways. It had long controlled Guatemala’s politicians. It’s power was so extensive that one historian compares it to the Dutch East India Company in its influence. It’s shareholders and supporters were amply distributed throughout the foreign policy establishment in the US. As US Marine Corps Major General Smedley Butler made clear in 1935, the US military was used to deal with any resistance to American corporations’ business interests overseas. Guatemala is a case study in this regard. 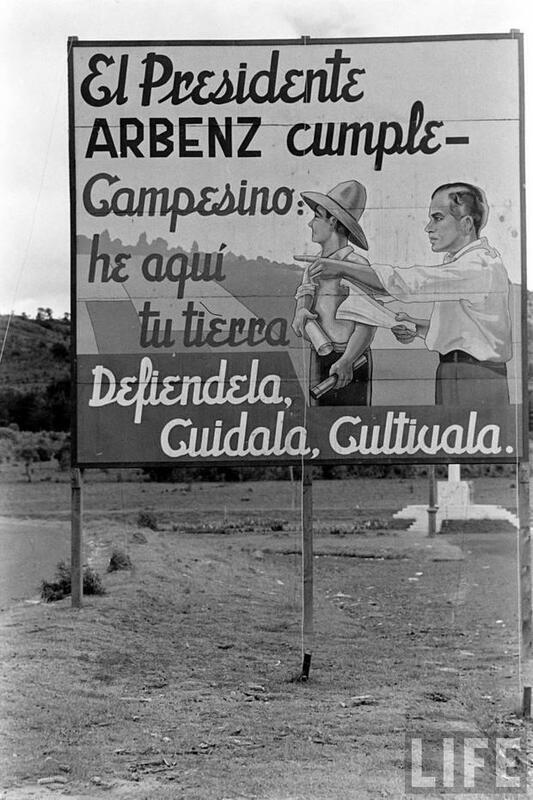 President Arbenz’s land reform act of 1952 — Decree 900 — expropriated rural farm land, 70 per cent of which was in the hands of 2 percent of the landowners, including vast acreage controlled by United Fruit but, significantly, only land not under cultivation by the company. The land was redistributed to poor peasants. The owners ( who included Arbenz himself) were to be compensated at fair market value. But this arrangement was not acceptable to United Fruit or their backers in Washington. The American Ambassador to Guatemala, John Peurifoy (CIA Director Allen Dulles’s handpicked man), then tried to bribe Arbenz with a $2 million payoff to terminate the land reforms. Arbenz refused, and his overthrow was set in motion by the CIA. Bernays was called upon to present the land redistribution as a communist takeover and a threat to US national security. His media propaganda campaign, presenting Arbenz as a communist in league with the USSR, together with the CIA’s additional propaganda, created the justification for the CIA-led coup. The excellent documentary by Adam Curtis, The Century of Self, documents Bernays’s profound and largely pernicious influence on American life with a section specifically devoted to his propaganda efforts on behalf of the 1954 coup. Today’s “mainstream media” has learned a lot from Bernays, so if one wishes to see through the vast amount of propaganda and dissimulation in current news coverage, learning about Bernays is crucial. The recent arrest of Guatemalan President Otto Perez Molina on corruption charges cannot be understood except within the larger context of US interference in Latin American countries going back more than a century. And that record of US meddling in Central and South America has been largely left out of official histories of the United States. The rise of the CIA to virtually unchallenged supremacy in Washington’s power structure is but one part of this backstory. Peter Dale Scott, who has written voluminously on the subject, calls this phenomenon of a de facto shadow government hidden behind the public facade while serving corporate interests, “the deep state.” This secretive power elite, through its decades-long support of coups and death squads in Guatemala, has linked that country’s fate inextricably to US interests and policies.